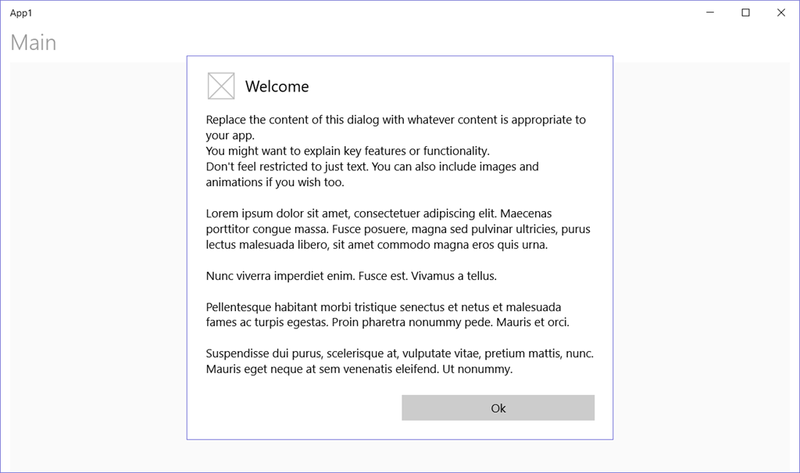 In this article we describe how to build an elegantly designed and animated fluent ToggleButton-Popup combination for use in UWP apps as an alternative for the less fluent Button Flyout. The code is not mine, I merely reused code and components from the Continuity framework by Justin Liu. This frameworks contains a lot of helpers for implementing Fluent Design in your apps without needing Windows 10 Fall Creators Update. The ToggleButton-Popup combo is an excellent widget to display extra information such as a help text. Closing the button and dismissing the flyout come with reverse animations. I’ve been looking for ways to animate opening and closing Flyout or ContentDialog instances. I went through many of the XAML animations techniques, but could not find a way. Flyout and ContentDialog don’t come with Visual States, so Visual Transitions are not an option. Although its name seems promising, PopInThemeAnimation is not applicable. And if it were, it doesn’t come with a scale animation (only opacity and translation). its HorizontalOffset bound to the ActualWidth of that same button. The content of the Popup (not the Popup itself) is given implicit Show and Hide Composition API animations. That’s it! Let’s dive into some details. It also comes with a circular custom style and some nice visual effects and animations. 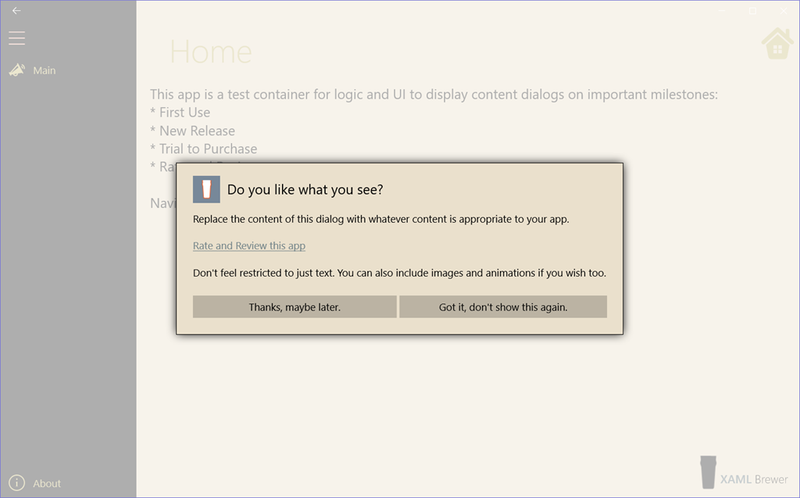 The Popup control is a XAML container that allows you to place content on top of other content. You can not animate the Popup itself but fortunately you can animate its content. As promised we’ll use Composition animations for this. These are 60-frames-per-second animations that run independent of the UI thread. They’re a bit harder to write, but there are a lot of helpers available, like these from UWP Community Toolkit. Here’s part of its implementation. Under the hood, a lot of different animation techniques were used to create this user experience, but I love the result! And while it’s probably possible to forge this into a single custom control, I’m not sure if it would add much value…. The ‘fluent button flyout’ sample lives here on Github, the inspiring Continuity by Justin Liu is right here. This entry was posted in Composition API, User Controls, UWP, UX on December 15, 2017 by xamlbrewer. it’s time to rate and review. 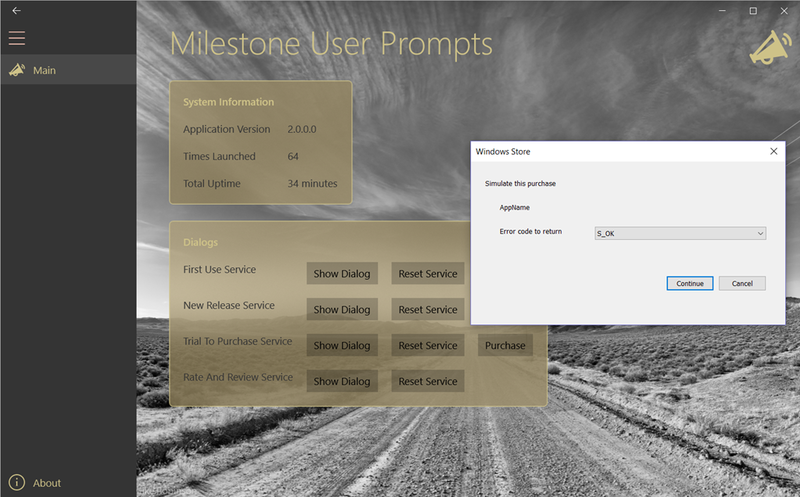 The architecture of the solution comes with one helper service and one content dialog for each milestone, and one central activation Service to rule them all. Exactly the same constituents are found in a Windows Template Studio based project (in Basic MVVM and Code Behind style projects). 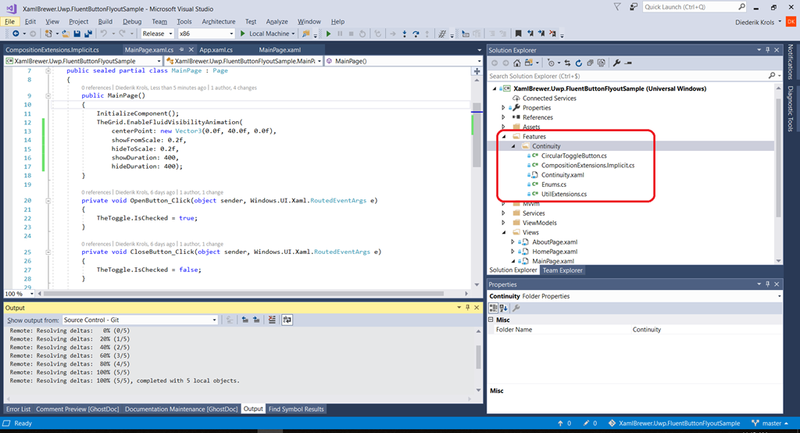 The logic to detect whether or not a milestone is hit, is powered by helper classes from UWP Community Toolkit v2.1. 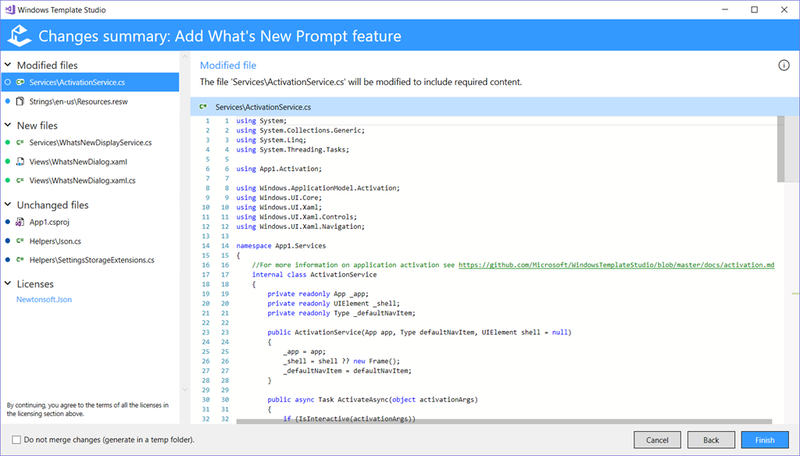 Windows Template Studio provides a clean architecture and a straightforward way of introducing new user prompt services and any other service that needs to run on application startup. Let’s take a look at some other relevant goodies that this toolkit provides. IsFirstRun Gets a value indicating whether the app is being used for the first time since it was installed. IsAppUpdated Gets a value indicating whether the app is being used for the first time since being upgraded from an older version. LaunchTime Gets the DateTime (in UTC) that this instance of the app was launched. LastLaunchTime Gets the DateTime (in UTC) that this was previously launched. LaunchCount Gets the number of times the app has been launched. AppUptime Gets the length of time this instance of the app has been running. FirstVersionInstalled Gets the first version of the app that was installed. FirstUseTime Gets the DateTime (in UTC) that the app as first used. 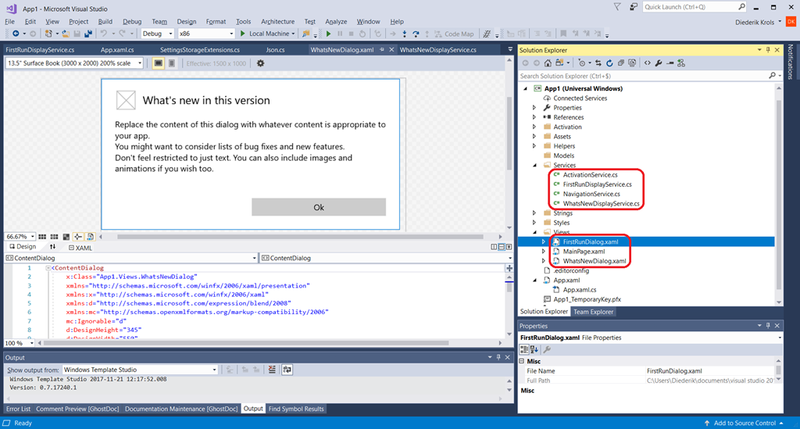 LaunchStoreForReviewAsync() Launch the store app so the user can leave a review. TrackAppUse() Track app launch time and count. bool KeyExists(string compositeKey, string key) Detect if a setting already exists in composite. T Read<T>(string key, T) Retrieve single item by its key. T Read<T>(string compositeKey, string key, T) Retrieve single item by its key in composite. void Save<T>(string compositeKey, IDictionary values) Retrieve single item by its key in composite. Save(String, IDictionary) Save a group of items by its key in a composite. void Save<T>(string key, T value) Save single item by its key. These classes will definitely allow you to write the complex milestone scenarios that your application may require. 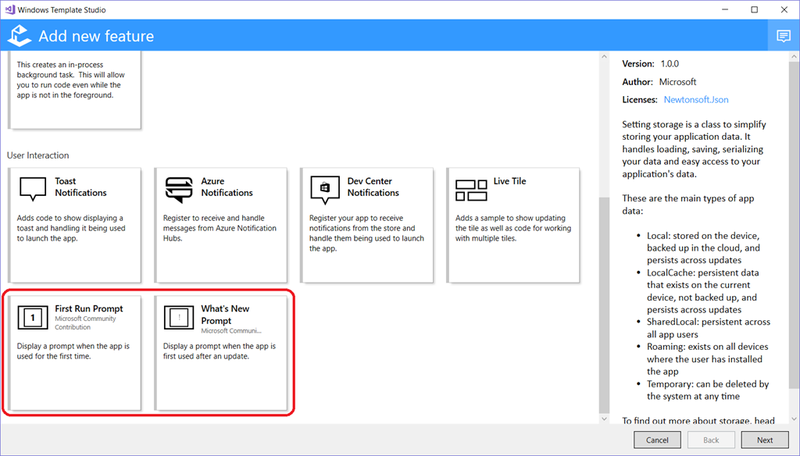 UWP Community Toolkit provides the helpers to implement the logic and persist the settings for user prompt services and any other service that needs to run on application startup. Let’s say you want to execute some stuff the first time the application is started after a milestone, but you want to keep on opening the user prompt dialog on startup until the user explicitly opts out via the don’t-show-this-again checkbox. Well, that’s exactly what we’re going to do. // Custom pre-launch service calls. // Custom post-launch service calls. determining the page to navigate to. Let’s dive in the details for each milestone. All other milestone services follow the same pattern. 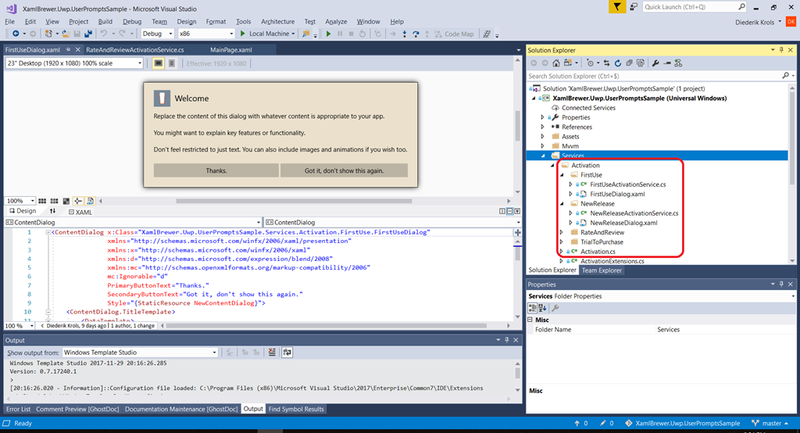 // New release app initialization. // Trial: set HasShown to false to trigger detection. // Purchased: set HasShown to true to inhibit detecting, but only if we were not detecting already. For the last milestone service in this article, the UWP Community is back in full force. There’s no ideal moment for popping up a dialog to send the user to the store to rate or review. 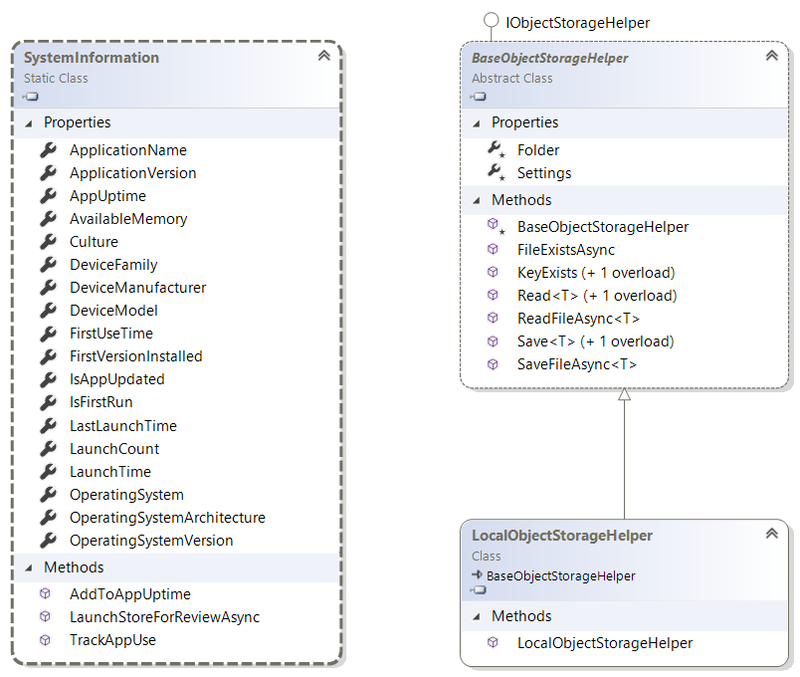 But for some applications this is important, and the SystemInformation helper has all the members to brew your own logic: when the application was first launched, how many times it has been launched, how long the current instance is running, and so on. // Make the AppUptime cumulative over sessions. SystemInformation.TrackAppUse(e); // Resets AppUptime to 0. 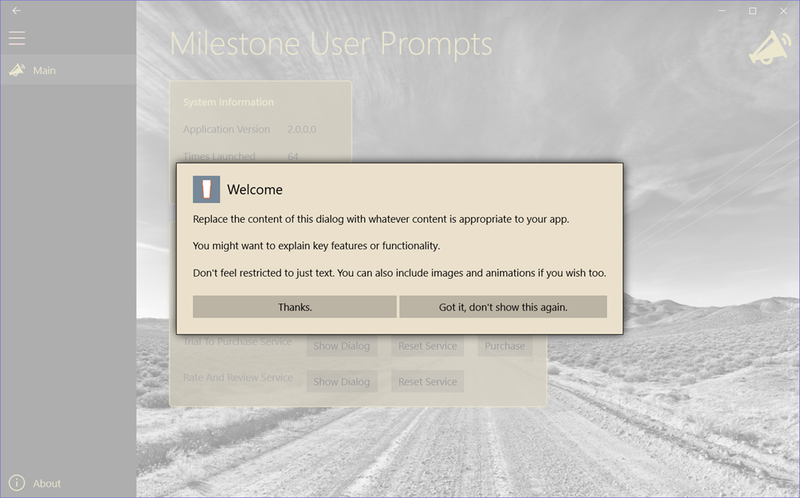 And that concludes the list of milestone user prompt services. I think that the architecture and implementation is generic enough so you can use some of it in your own applications. This entry was posted in UWP, UWP Community Toolkit, Windows Template Studio on December 3, 2017 by xamlbrewer.